Ever since the 1975 thriller JAWS burst onto the cinema screens, the world has been terrified of sharks, the Great White Shark (GWS) in particular. It's true, the GWS is the only shark species that targets mammals, feasting on pinnipeds wherever they can be found – and very occasionally mistaking us for the flippered variety. Here aboard True North we're sailing through the nutrient-rich waters of South Australia's Eyre Peninsula, perhaps the most populous location in the world for these monstrous beasts. It was here, just outside Port Lincoln, where the famous cage scenes from JAWS were filmed – with a live shark. In recent years, Australia has been in a minor media frenzy with a blip in shark attack numbers and numerous theories are being put forward. But from a public perspective, the biggest fear we have stems from our ignorance of these animals who are, for all intents and purposes, just going about their business. 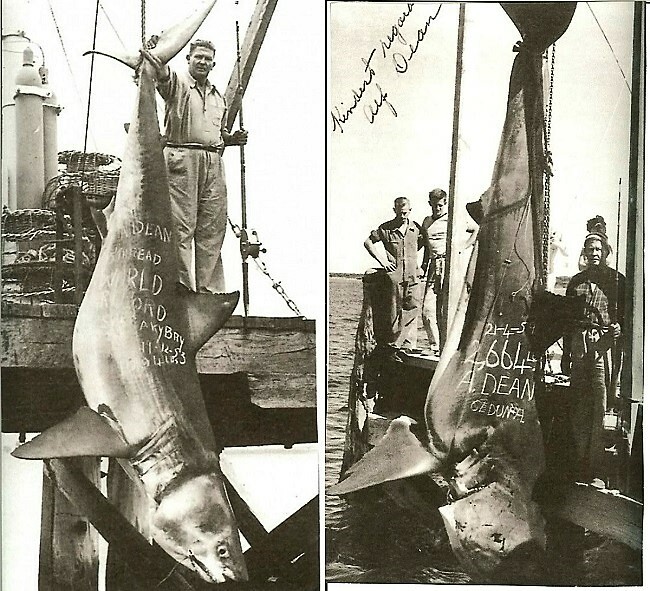 Alf Dean World Record 1200kg Great White caught at Ceduna in 1959. The bait? A dolphin. In the early and mid-20th century, fishermen would revel in the chase, eagerly displaying their trophies including the largest fish ever caught on a hook and line, Alf Dean's 1200kg Great White landed right here at Ceduna. Great Whites over 6 metres and 2000kg have also been recorded, caught using harpoons and barrels. GWSs have been a protected species in our waters, along with all sharks, since 1990. 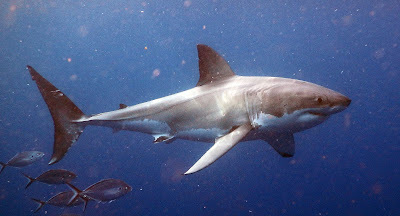 For more than ten years, shark cage diving has been available in Port Lincoln with two or three operators including Rodney Fox and Calypso Star, with True North using the latter since Southern Safari was first offered. As this is my second Southern Safari, so it is my second dive with Calypso Star. Get a bite of this! Now, as you can imagine, there has been some debate about the merits of shark cage diving especially when it comes to attracting the animals with fish guts. Rules have tightened, so it is now no longer permitted to feed the sharks, just lure them. Our day started slowly with lots of schooling trevally hoovering up the tuna scraps while the water rinsed thick with blood. It wasn't until a couple of hours had passed until our only circumspect candidate arrived, a modest 3-4 metre specimen (pic above). No thrashing or breaches, our shark merely cruised among the frenzied fish for perhaps an hour, then decided there was nothing to eat and wandered off toward the nearby seal colony. A sighting nonetheless. Tick. 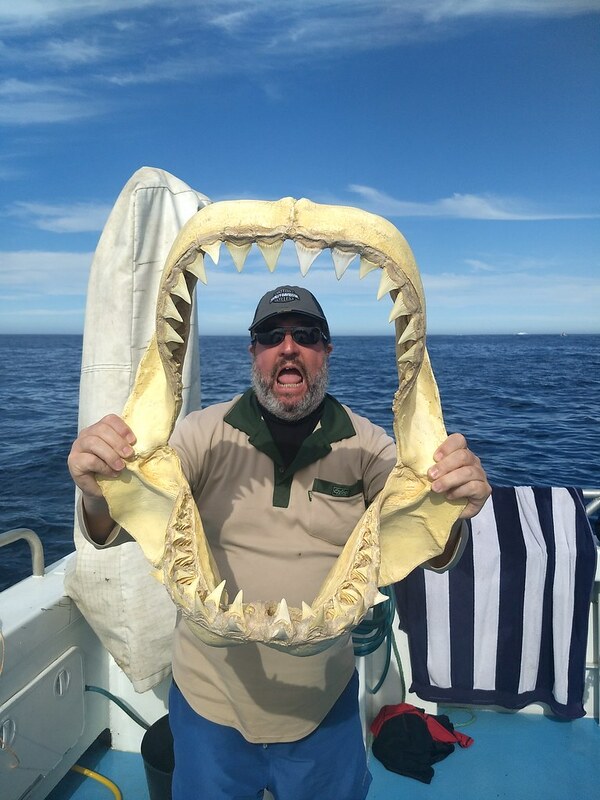 Even though there was no comparison to my first wild encounter where three sharks fought tooth-and-nail for the bait, True North guests certainly had an up-close experience with the ocean's apex predator and hopefully found a new respect for these perfect animals, the product of millions of years of evolution.